Purity of design. Dedicated to the Maxi Enduro, the Sport Touring / Adventure and Crossover of last generation, the new 4-Track discharger loves the thrill of the great spaces and the roads that go beyond the horizon. Designed in the R & D Center of Bologna, the new HP CORSE creature is born strong, able to withstand the most demanding situations and to the many km ridden to accompany motorcyclists through the roads and paths, mountain steps, deserts all over the world. Tested for more than a year on the bench and on the most demanding routes, the new HP CORSE product assures reliability and improved performance respect all the original dischargers that replaces in particular way the low and midrange regimens. HP Corse 4-Track is light, it has an octagonal shaped bottom, it has a seamless hydroformed spout and a silencer body with a laser engraved logo, available in three different materials: Titanium, Satin Steel, and Ceramic Black Stainless. A stunning design, sprung from the imagination of the “Master Craftsmen” of Hp Corse and designed exclusively for MV AGUSTA “ TRE PISTONI”(no F3). HYDRO TRE is a system unique in the world, incredibly beautiful and powerful, available in Satin Stainless Steel and Ceramic Black. HYDRO TRE consists of a pre-silencer “Reverse” and three hydroforming “Organ Pipe” discharges in decreasing sections so as to the graft fittings have decreasing sections. HYDRO TRE has the HP Corse logo laser and it has a unique character and absolute capability to capture passion and desire of the finest customers. The material is molded, all resistance is overcome, and the excitement takes shape. HYDROFORM is not only the name of a new line of exhausts, it is something that goes beyond the rules to get where, until now, only the imagination had dared to go. Hydroforming is an incredibly sophisticated technology that utilizes highly pressurized fluid to form metal by injecting it into a blank tube, encased in two die-halves, causing it to expand into the shape of the die mold. That is how we managed to get a variable form that is seamless, with an incredible volume. With a record lightweight, incredibly low thickness and mechanical rigidity, the end result is a sinuous, uniquely exciting product, that provides a seamless flow of exhaust gases. The exhausts from the HYDROFORM line are born to equip the most beautiful, naked, sport and hyper-sport motorbikes existing at the market. With HYDROFORM the sound, the charm, and the power will never be the same again. HYDROFORM becomes "CLASSIC". Equipped with a three-hole cover in different sizes and provided with net, HYDROCLASSIC exhauster has an old-looking and racing aspect at the same time. Both the silencer body and its cover are available in satin or black ceramic stainless steel. At the moment only destinated for Ducati Scrambler, it will soon be available for other Vintage and Classic models on the market. The material is molded, all resistance is overcome, and the excitement takes shape. HYDROFORM-CORSA is not only the name of a new line of exhausts, it is something that goes beyond the rules to get where, until now, only the imagination had dared to go. Hydroforming is an incredibly sophisticated technology that utilizes highly pressurized fluid to form metal by injecting it into a blank tube, encased in two die-halves, causing it to expand into the shape of the die mold. That is how we managed to get a variable form that is seamless, with an incredible volume. 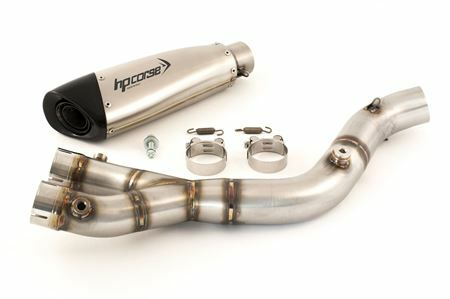 With a record lightweight, incredibly low thickness and mechanical rigidity, the end result is a sinuous, uniquely exciting product, that provides a seamless flow of exhaust gases. 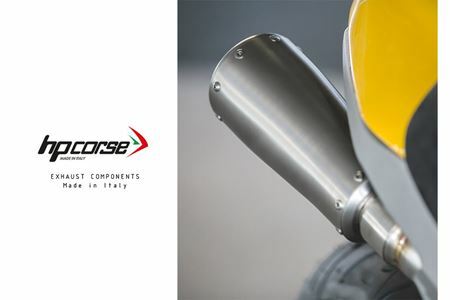 The exhausts from the HYDROFORM-CORSA line are born to equip the most beautiful, naked, sport and hyper-sport motorbikes existing at the market. 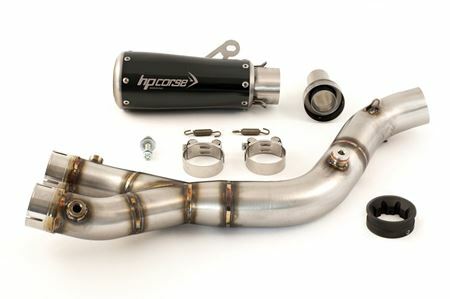 With HYDROFORM-CORSA the sound and the power will never be the same again. The material is molded, all resistance is overcome, and the excitement takes shape. HYDROFORM-SHORT is not only the name of a new line of exhausts, it is something that goes beyond the rules to get where, until now, only the imagination had dared to go. Hydroforming is an incredibly sophisticated technology that utilizes highly pressurized fluid to form metal by injecting it into a blank tube, encased in two die-halves, causing it to expand into the shape of the die mold. That is how we managed to get a variable form that is seamless, with an incredible volume. With a record lightweight, incredibly low thickness and mechanical rigidity, the end result is a sinuous, uniquely exciting product, that provides a seamless flow of exhaust gases. 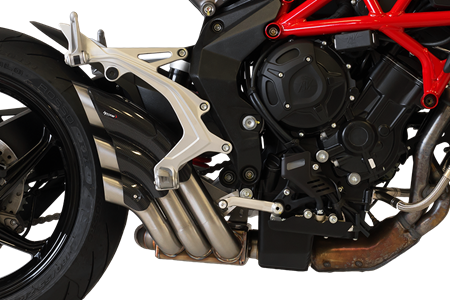 The exhausts from the HYDROFORM-SHORT line are born to equip the most beautiful, naked, sport and hyper-sport motorbikes existing at the market. With HYDROFORM-SHORT the sound and the power will never be the same again. BUILD YUOR SPECIAL EXHAUST HP Corse “laboratory” works closely with the best national and international operators of “SPECIAL” moto’s. 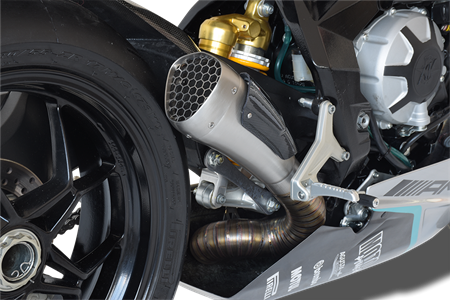 We manufacture in our own workshops prototypes directly on the customer’s motorbike or we supply single terminals of HYDROFORM, EVOLUZIONE and GP-07 series to those who desire to build the exhaust system on their own. We also produce customized curves and flanges.